Enterprises will tap the power of AI for faster innovation and a competitive edge. Yet AI requires a completely new infrastructure, and its complexities are holding enterprises back from moving into the new era of intelligence. technologies, leading to months of delays and idle time. power of NVIDIA® DGX™ systems. 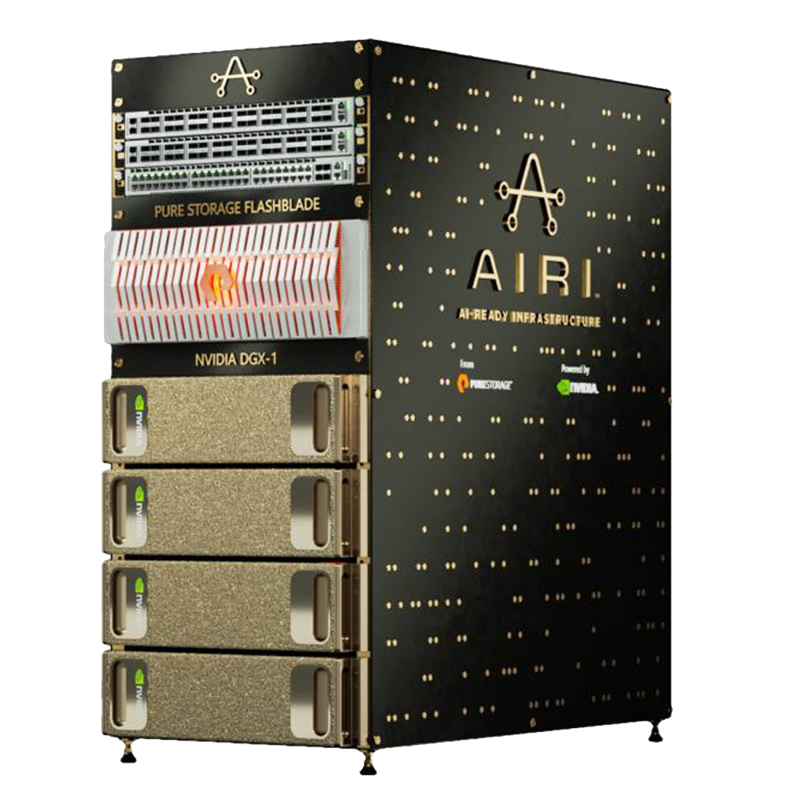 Powered by FlashBlade™ storage and NVIDIA DGX-1 servers, AIRI offers enterprises a simple, fast, and future-proof infrastructure to meet their AI demands at any scale. AI pushes beyond the reach of legacy technologies like serial CPUs and spinning disks. At the core of AIRI are NVIDIA® DGX-1™ servers and FlashBlade, industry-leading solutions architected for AI. Each replaces the performance of racks of legacy technology, offering data scientists the power of a large supercomputer for any AI initiative. “Do-it-yourself” infrastructure requires constant tuning. As one bottleneck is resolved, another often shows up somewhere else in the system, resulting in weeks to months of lost productivity. AIRI is a complete infrastructure, tuned from software to hardware to keep the GPUs busy for workloads at any scale. AIRI is built with a complete software stack enabling data scientists to get up and running in a few hours, not weeks or months. AIRI Scaling Toolkit allows users to run their first multi-DGX training within hours, with a few commands, and to slash training time from weeks to days for their most critical AI workloads. ElementAI is an artificial intelligence solutions provider that gives organizations unparalleled access to cutting-edge technology. It is founded by leading AI experts, including Yoshua Bengio, who is widely considered to be one of the three pioneers of deep learning.